Life is the debut UK exhibition curated by Heaps Good, showcasing 19 of Australia’s leading emerging and established artists with the aim of raising funds and awareness for (RED). This diverse group covers a wide range of Australian visual creativity and even brings in some old faces of uniquely important aesthetics from Australia. 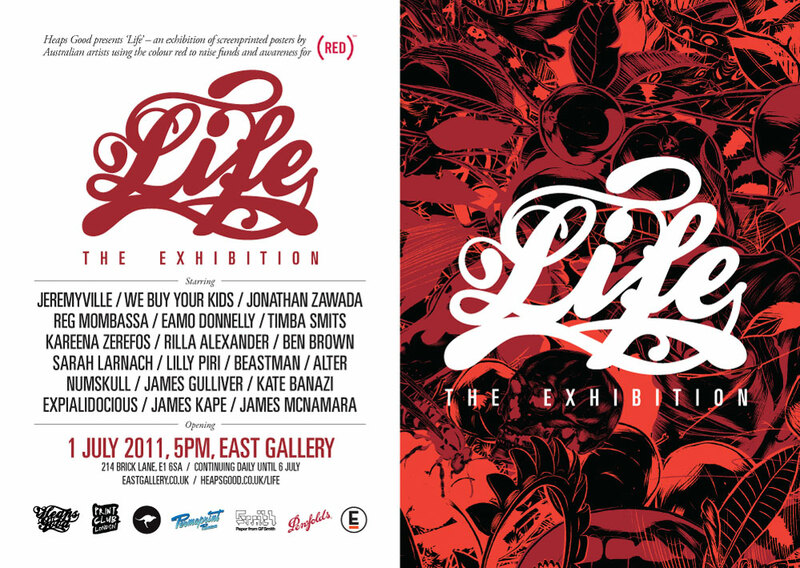 Each artist has created a two-colour screen printed poster (one colour being red) to the theme of ‘Life’. These come in an edition of 20 that are screenprinted on GF Smith Colorplan paper with Australian Permaset ink at The Print Club London. Each print will be for sale unframed for £50, making this a very accessible and affordable exhibition. A signed certificate from the artist will accompany each work for authetication. Through Life – Heaps Good aim to raise awareness and funds for (RED). (RED) works with the world’s most iconic brands to make unique product items, giving up to 50 percent of their profits to invest in HIV and AIDS programs. Every dollar goes straight to the people who need it. www.joinred.com Profits after expenses from each artwork in Life will go to (RED). Quality Australian wine will be provided at the opening thanks to Penfolds. Penfolds: Sampling Australian wine on opening night.